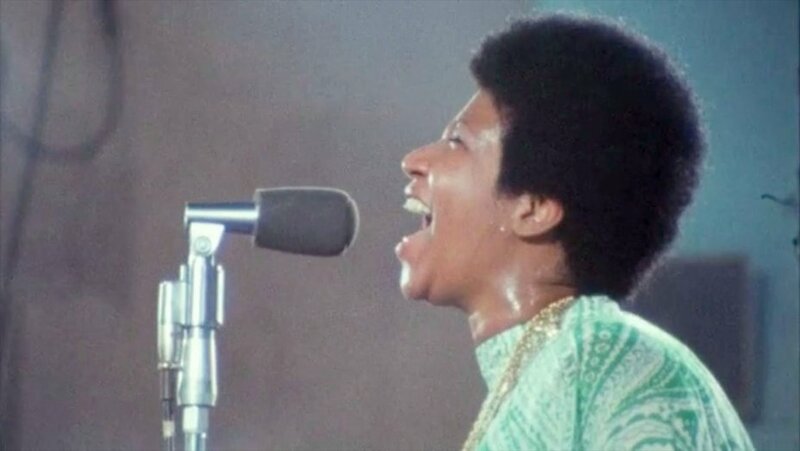 Supervisor Mark Ridley-Thomas hosted the Los Angeles premiere of Amazing Grace, a critically acclaimed documentary about the 1972 live recording of Aretha Franklin’s gospel music masterpiece of the same name. 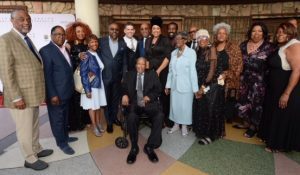 Sabrina Garrett Owens, a niece of the Queen of Soul, attended the premiere along with more than 400 other people at New Temple Missionary Baptist Church, the same church where the documentary was filmed 47 years ago. 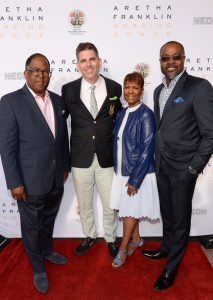 Ahead of the premiere, Supervisor Ridley-Thomas and Councilmember Marqueece Harris-Dawson sought to honor both the choir and the church that co-starred with Franklin in that legendary performance. 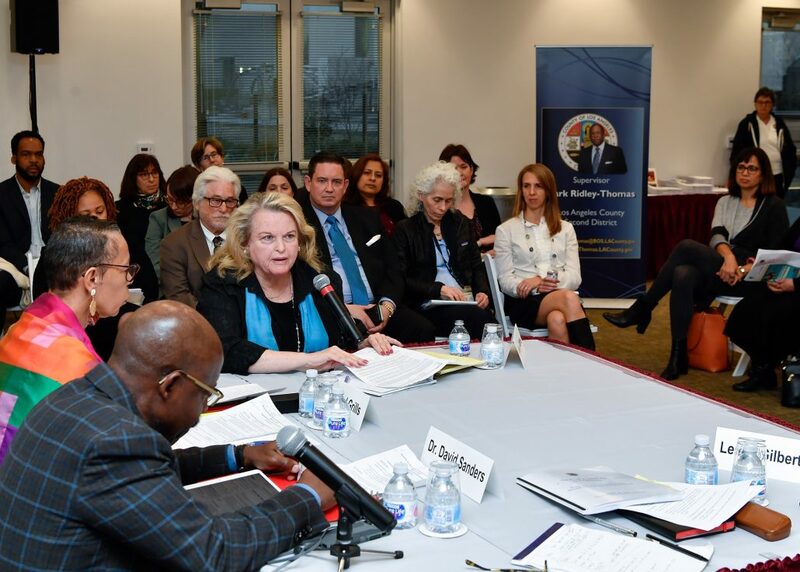 Supervisor Ridley-Thomas nominated the Grammy Award-winning Southern California Community Choir for a star on the Hollywood Walk of Fame, while Councilmember Harris-Dawson urged the Los Angeles City Council to designate the New Temple Missionary Baptist Church as a Historic-Cultural Monument. Supervisor Ridley-Thomas nominated the choir to the Hollywood Chamber of Commerce, which administers the Walk of Fame. Their performance with Franklin, under the direction of the Rev. James Cleveland and the Rev. Alexander Hamilton, produced the best-selling gospel music albums of all time. The choir has also performed with Elton John, Arlo Guthrie and Kansas, and won a Grammy Award for Best Soul Gospel Performance in 1975. The New Temple Missionary Baptist Church provided the backdrop for Amazing Grace, not to mention a seat in the audience for the Rolling Stones’ Mick Jagger, who sang and danced along with the crowd. The structure was originally developed as a theater and stores in 1932 but underwent several alterations, including an addition designed by the legendary African American architect Paul R. Williams. It was converted into a church in early 1958. In his motion urging the Los Angeles City Council to initiate the process of declaring the church a Historic-Cultural Monument, Councilman Harris-Dawson described the church as an icon to be celebrated in African American and Los Angeles history. “This is yet another example of how South Los Angeles is a beacon of culture then and now,” Councilman Harris-Dawson said. 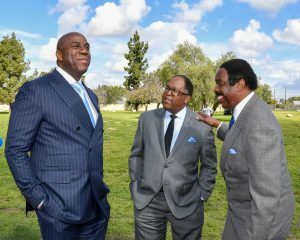 Surrounded by hundreds of cheering South Los Angeles residents, Supervisor Mark Ridley-Thomas and Earvin “Magic” Johnson kicked off a $70-million renovation of the park bearing the basketball legend’s name in the community of Willowbrook. The project represents the largest investment in a park improvement ever by the County of Los Angeles, and is the first phase of a master plan that is slated to dramatically transform Magic Johnson Park over the next two decades. 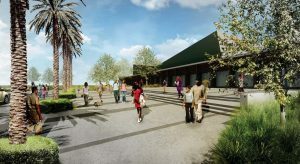 The project, slated for completion in Fall 2020, includes a 20,000-square foot state-of-the-art community events center for holding weddings, conferences and other large gatherings; an outdoor wedding pavilion; a splash pad and children’s play areas; improved walking paths with security lighting; and acres upon acres of new landscaping that will give the park an entirely fresh look. 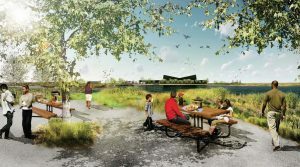 The lake that is currently the centerpiece of the park will be getting an innovative feature that will help address both water conservation and water quality goals. It will divert storm runoff from surrounding neighborhoods and nearby Compton Creek, clean it and then use it to fill the lower lake and irrigate 30 acres of the park, creating a wetland experience for park goers. Another benefit is that the renovation will create hundreds of jobs. The County hired contractor S.J. Amoroso Construction Company to build the project and required that 30 percent of all construction hours be rendered by local residents living within 5 miles of the park, or in zip codes countywide that have high poverty rates. The Los Angeles County Museum of Art (LACMA) is considering opening a satellite location within Magic Johnson Park while its main campus on Wilshire Boulevard is undergoing its own massive renovation. The Magic Johnson Park renovation is only the latest of many investments that have transformed the community of Willowbrook. 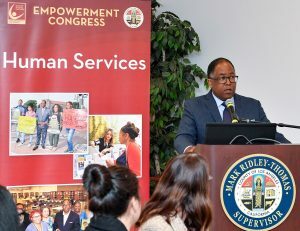 Over the last several years, Supervisor Ridley-Thomas has championed a building boom that included the Martin Luther King Medical Campus, Willowbrook Library and Senior Center, AC Bilbrew Park, the development of hundreds of units of affordable housing, and upgrades to Metro’s Rosa Parks Station. Longtime resident and community leader “Sweet” Alice Harris said, “This investment in Magic Johnson Park, and the greater community, is nothing short of a blessing. A new interactive exhibit traces the history of housing discrimination across Los Angeles and the United States. 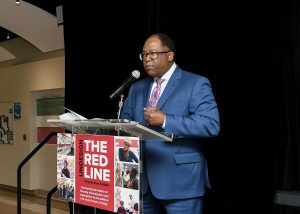 Los Angeles County Supervisor Mark Ridley-Thomas joined Enterprise Community Partners (Enterprise), Los Angeles Trade Tech College (LATTC), Designing the WE and Wells Fargo to present Undesign the Redline. 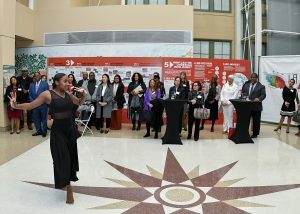 Created by social impact firm Designing the WE in partnership with Enterprise, the interactive exhibit uses narratives, maps and other documents to trace how government policy, known as “redlining,” created racial segregation and disinvestment in communities from the 1930s to present-day. The exhibit combines historical artifacts, storytelling, photographs and activities to illustrate redlining’s roots and lasting repercussions. Redlining has limited people from housing opportunities and their associated benefits, including the choice of where to live, whether to rent or own, and wealth generated by homeownership. Today, the growing threat of displacement caused by increasing housing instability is impacting these same neighborhoods. • The Federation of the High Cost of Living, which was formed to explore how rental costs could be lowered. 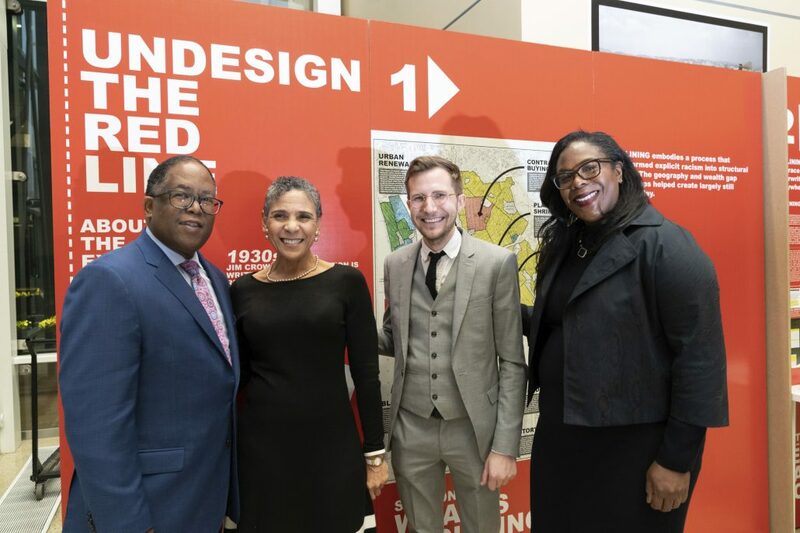 “Undesign the Redline sheds light on how the explicitly discriminatory housing practices of redlining continues to influence the design and growth patterns of Los Angeles today. But learning this history inspires us to change that legacy and encourages us to transform our communities,” said Jacqueline Waggoner, VP and Southern California market leader, Enterprise. The exhibit is now on display at LATTC’s Magnolia Hall until March 31, 2019.